PARIS, July 11. /TASS/. French President Emmanuel Macron is planning to have a word with Russian counterpart Vladimir Putin during the FIFA World Cup final on Sunday featuring the national football team of France vs the team of either England or Croatia, a source at the Elysee Palace told TASS on Wednesday. "The president [Macron] had an amiable phone conversation with Vladimir Putin yesterday [on Tuesday] and they [Macron and Putin] will talk on Sunday during the final," the source said. 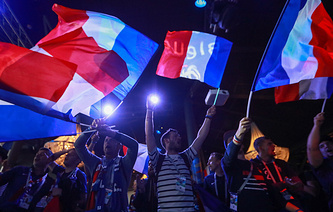 The French national football team defeated Belgium 1-0 in the semifinal match of the 2018 FIFA World Cup, played on Tuesday night in St. Petersburg, to become the first team to vie for the much-coveted FIFA World Cup Trophy this year. France will now take on the winner in the England vs Croatia semifinal, scheduled for Wednesday night in Moscow. The final takes place at the Luzhniki Stadium in Moscow, kicking off at 21.00 Moscow Time on Sunday. The Kremlin press service had said earlier that shortly after the semifinal between the teams of France and Belgium, Russian President Vladimir Putin called French President Emmanuel Macron. Putin "warmly congratulated Macron and all French fans on their team’s victory in this match and their advancement to the World Cup final," the Kremlin said. It will be a third visit by Macron to Russia this year. In late May, the French president attended the St. Petersburg International Economic Forum (SPIEF) upon the invitation from President Putin. 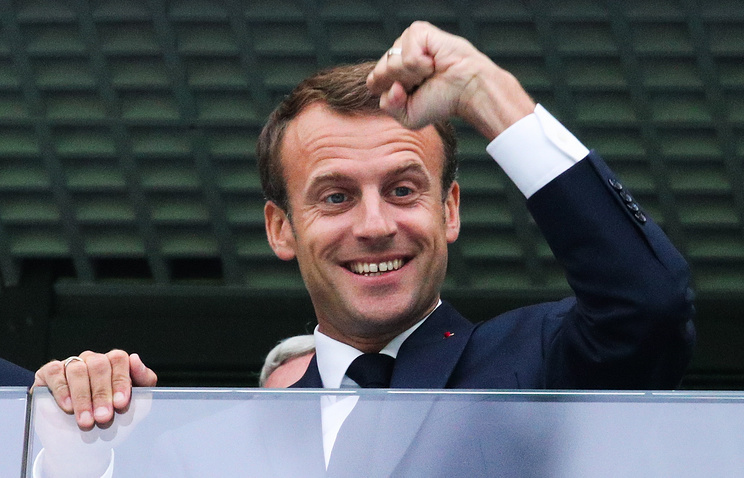 On Tuesday, Macron rooted for the national team of France at the St. Petersburg Arena. Among other dignitaries present at the match were FIFA President Gianni Infantino, King Philippe of Belgium with his spouse Queen Mathilde and Speaker of the Federation Council (Russia’s upper house of parliament) Valentina Matviyenko. Russia is staging its first-ever FIFA World Cup, which kicked off in Moscow with a remarkable opening show at Luzhniki Stadium on the evening of June 14.